#Transformation Tuesday” is sort of a thing on Social media and also in My Peak Challenge (MPC) circles. I never really got around to properly participate in it yet, but this post will be a start and for this first one I’ll focus on the hiking part of the transformation. One of the many amazing changes MPC has brought into my life was, that I started to enjoy hiking. My parents loved to take us hiking when we were kids, but until MPC made me look for some challenging activity I never considered hiking an interesting enough thing to do in my free time. Part of the reason for that might be classic rejection of stuff my parents made me do when I was a kid. The other part probably also was me I was too out of shape to enjoy a strenuous ups and downs of a hike in the mountains or even just hills. I guess, the fact that I do enjoy that now, is one of the many things I’m grateful about since I took up MPC for real last year. This summer I had the opportunity to do some hiking on some of the highest mountains in Wales. And I thoroughly enjoyed it! For the most part ;-) But seriously it’s been amazing to challenge myself to do it and to experience that I can do it! It did wonders for my ego, and if you know me just a little, you know that my ego needs boosting every once in a while. In a kind of reckless “Go big or go home” attitude I was determined to tackle Snowdon – with 1085m the highest mountain in Wales and in fact the 3rd highest mountain on the British Isles this summer. And because one peak is basically like no peak, I also wanted to do another hike in the South a few days prior: Pen y Fan, the highest summit in the Brecon Beacons (886m). With the bonus of passing by Corn Du (873m) on my way back down. I spent quite some time doing research in advance: which route to do on either mountain, how to get there, how long it might take etc. I changed my Snowdon routes kind of last minute (before I flew over though) and that was a good thing, because the original plan would have meant to get back down a similar way I went up and I probably would have been a wreck at the end of that. If not physically, than at least mentally, because having to scramble down some of the rocky parts of the trail I went up would have made for a very anxious and thus not very relaxing descent. I was lucky enough that the weather was perfect for a hike on both of the days I had planned to do it. The “test hike” up Pen y Fan on 1st August was a very good one. I chose to not take the quickest route which would have been up and down from the same southern side. Instead I opted to do a longer circular route (12 km) which also brought me along Corn Du, before slowly leading me back down to the parking lot north of the mountain. All in all it was about 500 m ascent and a similar descent, which wasn’t too bad. It’s been strenuous in parts, but actually very doable for me, except for the last bit up the actual summit. That was basically a wall of rock and I had to put my hiking poles away and use my hands to find a good grip and scramble up. It was just a short passage, but I gulped for a moment when I stood there. But… I made it up successfully. Go Me! I know it might be less of a big deal for other more experienced people, but it felt like a huge achievement for me and I marvelled at myself to be honest. You can see the proud and happy smile on my face in one of the photos. And it was a good thing I had that positive, empowering “Yay, you can do it!” experience, because on the hike up Snowdon a few days later I really needed to believe that I could manage the rocky sections. Of which there were plenty! The way back down from Pen y Fan was a bit difficult for me in some parts and it often feels even harder going down than up, but it worked out all right. On 5th August 2018 I was heading towards Llanberis in Snowdonia to tackle Snowdon. Getting to my starting point proved a bit more difficult than I expected and I admit I had a hard time to let go of the anger I felt over that. Luckily I was able to let go of that and start my hike in a happily excited way instead of being grumpy and resentful. 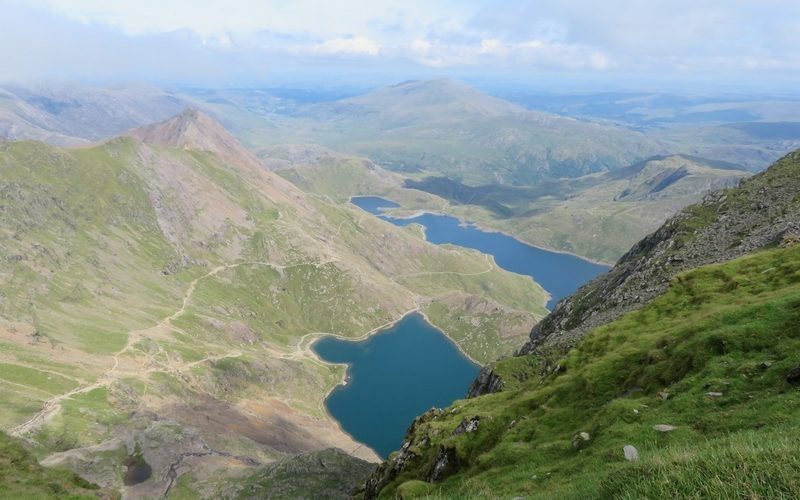 Either hike up Snowdon is about 600 – 700 metres ascent over a 4-5 km distance. I chose the Pyg Track on the eastern side to hike up and the “easy” steady Llanberis path on the northern side to hike down. Which for several reasons was the best choice I could have made. For one, because it might have taken me too long to hike back down the Eastern slope and I might have missed the last bus back to Llanberis, where I had parked my car. And more importantly, because the trails on that side include quite a few steep / rocky sections. And if I say “quite a bit” I actually mean “OMG so many!” I’m usually a big fan of my hiking poles but from about half the way up I couldn’t use them and stored them away in my backpack, because I needed both hands to scramble up and over the rocky passages. And the higher I went the more steep and rocky parts appeared. At least that’s what it felt like. While I was on my way up, there were already folks coming down and I watched with mounting trepidation how they had to manoeuvrer in some parts to get down. And I wasn’t sure and I still ain’t if I could have managed to do that. I admit that unlike the hike up Pen y Fan, I actually had my moments of doubts on my way up Snowdon. Doubts if I would really be able to get all the way up there. Like I said: So many steep and rocky sections. For this inexperienced mountain hiker at least. For quite a bit of the way up I was walking behind or in front of a family with two young children, a 5 year old boy and a girl, who was around 3, I’d guess. And those children were amazing. Energetic and curious and fearless. Oh so fearless. And I mean that in a good way here. (yes, I know being fearless can also be very risky on a mountain). But I think on some parts of the trail I spent way too much time in my head, worrying about if I could really manage to scramble over this or that and if I would be able to put my feet on the right rocks to get over that obstacle. Or worrying if I’d look too much of a clumsy hippo on a mountainside. Looking back how far I had already come help to get perspective. Getting up somewhere high does help with perspective on general I think. There had been one moment on a steep but not too rocky path, were I stumbled for a moment and I was glad some other hiker had the instinct to grab me. I don’t think I would have fallen over the edge or anything, but it was a bit of a scary moment. The uplifting thing in a way was, that it was actually quite busy on the path. Snowdon does attract a lot of people and it was a sunny Saturday. But that also meant that there always would have been someone to help out if I had a mishap or anything. (See: hiker who grabbed me). And even if it felt like a lot of hikers around me were much quicker and maybe fitter, I still felt some weird kind of camaraderie. I mean, we all were crazy enough to spend our Saturday trailing up this mountain side. I was one of them and who cared if I was slower than most of them. At least I didn’t. Or at least even if that thought crossed my mind, my endorphins managed to shut it down after a while, because I was in fact fit enough and motivated enough and confident enough to hike up that freakingly high mountain! And I really need to thank My Peak Challenge for giving me this confidence. In my body. And myself. Slacker or not, I hiked up (and down) the highest Welsh mountain. Go Me! There also is a railway going up and thus a summit building, which in a way was a good thing (toilets, food, freshening up), but also meant that it was quite busy at the top of the mountain. Like crazy busy, because all the people from the railway were on a tight schedule to walk up the last few metres to the actual summit. In their fancy summer sandals and all glamoured up for a leisurely Saturday afternoon trip ;-). I was glad and proud I came up on my own two feet in my muddy boots, sweaty face and all. It’s so been worth it. Once again: Thank You My Peak Challenge!